Revolving Restaurant, Central TV Tower, No. 11 the Middle of West, 3rd Ring Road, Haidian District, Beijing 100142. 11 Xisanhuanzhong Lu, Beijing. Located on the Middle of West Third Ring Road, with the beautiful Yuyuantan Park and famous Diaoyutai State Guesthouse to the east, close to the newly-built Beijing West Railway Station in the south and overlooking the Summer Palace to the north. One revolution takes 90 minutes. Starlight Revolving Restaurant, 28th floor, Beijing International Hotel, 9 Jianguomennei Avenue (Jianguomen Wai Neidajie), Dongcheng District, Beijing. +86 10 6512 6688, ext. 6218. Revolving Restaurant which can see the city in bird's eye. Afternoon Tea: 2pm-5.30pm. Western-style Dinner: 5.30pm-10pm. Performance Bar: 10pm-2am. Rooftop, Top floor, Eastern Inn Hotel (Yiyu Liansuo Jiudian), 6 Baijiazhuang Road, Gongti Nan Lu (Sanlitun Nan Lu), Chaoyang District, Beijing 100020. +86 6595 9239. South of Sanlitun. Cocktails galore. Daily 6pm-2am. assagi, Sanlitún Bei Xiao Jie 1 Hào, Sanlitun Area, Beijing. +86 10 8454 4508 Little known outside of the embassy staffers, this upscale Italian restaurant has a posh rooftop. Daily lunch 12 noon-2.30pm. Dinner 6pm-11pm. Italian. Saddle Cantina, Nali Patio, 81 Sanlitun North Rd, Sanlitun, Beijing. +86 10 5208 6005 Near Sanlitun & Gonti beilu. Sanlitun's first real rooftop is still among the most popular. No view. Second floor deck. Evenings are best. Sun to Thurs 11.30am-2am. Fri & Sat 11.30am-4am. Xiao Wang Fu, Cháoyángqu Rìtán Gongyuán Nèi, JianWai Street, Beijing. Inside Ritan Park. +86 10 8561 7859/5985 located in the park, Dark, romantic, and only opportunity to take a moonlit walk in the park after dark. Daily 11am-2pm. 5pm-10pm. Chinese. i-Ultra, 3rd Floor, Number 8 Complex, 8 Chaoyang Park West Gate, Beijing. (entered via The lift beside Kong Yiji). +81 10 6508 8585. Between the Third and the Fourth Ring Roads. Rooftop terrace bar. Six venues to choose from. Brasserie Flo, Chao yang qu xiao yun lu 18 hao, San Yuan Bridge, Beijing. Chang Hng Qiao. +86 10 6595 5135 Small but intimate rooftop with excellent French cuisine. French. 11.30am-11pm. Suzie Wong, Cháoyángqu Nóngzhanguan Lù Jia 1 Hào Cháoyáng Gongyuán, Ximén, ChaoYang Park, Beijing. +86 10 6500 3377 Daily 8.30pm - late nightly. Le Little Saigon, B141 Jiu Gulou Dajie, XiCheng District, Gulou, Beijing. +86 10 6401 8465 Tiny and romantic rooftop with a slightly obstructed view of the Bell tower. The overhanging tree and lighting are hard to beat. 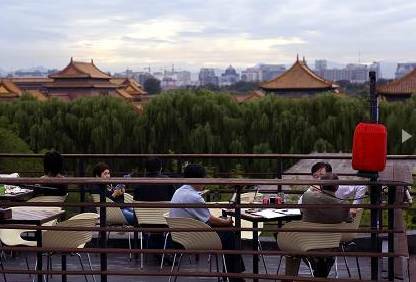 this rooftop is certainly one of the best in Beijing, Tues to Thurs 12 noon-11.30pm. Fri to Sun 12 noon-12 midnight. French. Vietnamese. Cambulac, Dong Chéng Qu Bei Bing Ma Si Hú Tòng 32 Hao, Nan Luo Gu Xiang, Beijing. +86 10 6402 5301 Near: Kuan jie, Jiao dao kou. Daily 10am-12 midnight. Saveur de Coree, Dongchéngqu Xiang er hutong 128-1 Hào, Gulou Dongdajie, Beijing. Nan Luo Gu Xiang. Dongcheng District. +86 10 5741 5753 Seating is at a premium at this Korean restaurant with a French name. Although chaotic below, it's peacefully quiet on the roof. View of the surrounding courtyards. Near: Jiao Dao Kou. 11am-11pm daily. (5mins walk from Bei Xin Qiao metro, exit-D). Nuage, 22 Qianhai Lake East Bank, Houhai, Beijing 100009. +86 10 6401 9581. Simply the best view of Houhai. The views from the roof terrace are simply fantastic. One side viewing the Houhai lakes and the other the Drum and Bell towers. Vietnamese. Daily 11am-2pm 5.30pm-10.30pm. Qing Yun Lou, 22 Qianhai Lake East Bank, Houhai, Beijing 100009. +86 10 6401 9581 First opened in 1820, this Shandong restaurant was extremely popular during the Qing dynasty. 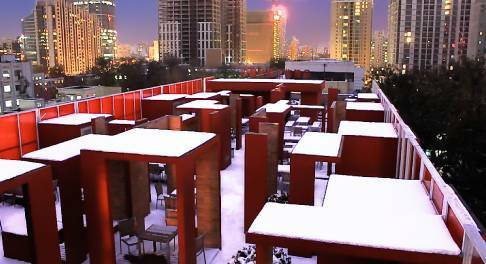 Today, it shares its historic location—and stunning rooftop—with Vietnamese restaurant Nuage. Lantung Bar and Bistro, 16-1 Solana Park, #6 Chaoyang Park Road, Solana, Beijing. +86 10 5905 6213 The view of Chaoyang Park to the south, the setting sun to the west, and a warm autumn breeze are a perfect combination. Three stories right on the water at the back of Solana. Cool layout. 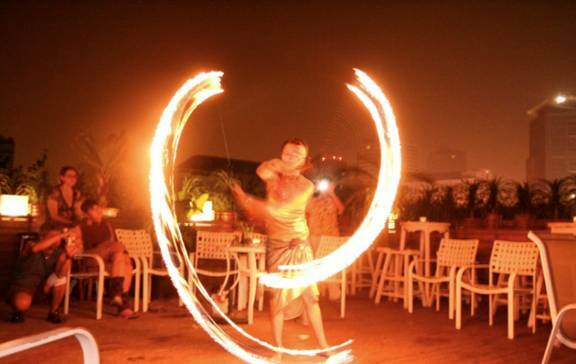 The rooftop in summer is going to have BBQ, satay, good music and hookahs. Daily 11am-2am. Thai Lounge. SALT, Cháoyáng qu jiang tái xi lùbei jing pò lì jiudiàn xicè, LiDu, Beijing. +86 10 6437 8457 Salt's rooftop is both down to earth and upscale. Just West of Rosedale Hotel. Daily 12 noon-3pm. Mon to Sat 6pm-10.30pm. Moving. The Orchid Bar, 65 Baochao Hutong, Dongcheng District, Beijing. +86 10 8404 4818 This boutique hotel bar offers wine by the bottle or glass, plus a few snazzy cocktails. In summer the layered terraces offer stunning hutong rooftop views. Drei Kronen, 1st Floor, Bldg 5, China View, Gongti Donglu, Chaoyang District, Beijing.+86 10 6503 5555 With two wraparound balconies and a rooftop beer garden, this mammoth microbrewery pours luscious in-house brews, coming from a 700-year-old Bavarian brand. Daily 11am-2am. Gulou 121, 121 Jiugulou Dajie, Gulou, Beijing. +86 10 8404 3430 Dark woods and dim lighting give this hutong music bar the look of a classic saloon. Upstairs has private rooms and a lantern-lit deck overlooking the Gulou rooftops. Daily 2pm-3am. Migas Dining, 6th Floor, Nali Patio, 81 Sanlitun North Road, Beijing. +86 10 5208 6061 Located at the top of Nali Patio, this chic restaurant boasts stunning design and a menu that focuses mainly on small dishes, with more generously portioned main courses. The rooftop lounge also serves as a very popular Sanlitun nightspot with views. Mediterranean. Hai Bar, 36 Yandai xiejie St, Beijing. +86 10 6403 4913 Daily 10am-1am. Great 3rd floor rooftop terrace with views of Houhai on one side and the Drum and Bell towers on the other. Secure the table in the turret to drink in the scenery. The best 360 views. The High Place, 798 Art District 4 Jiuxianqiao Lu, Chaoyang District, Beijing. Daily 10.30am - 8pm. Rooftop terrace. Across from UCCA. Tues to Thurs 12 noon-12 midnight. Fri to Sun 12 noon - late. Pass the red dinosaurs on the right side of the main street of 798, you will see Timezone 8 cafe on your left; walk past it till you see The High Place on your left. The West Pizza, Weigongcun-58 Minzudaxue Xilu, (West gate of Minzu University in the courtyard of the Youth Holiday hotel), Haidian District, Beijing. +86 10 6893 7218 Large rooftop terrace. Daily 11am-11pm. Shui Gui Qi, 183 Jiugulou Dajie, Xicheng District, Beijing. Daily 2pm-1am. +86 10 6403 4723 Rooftop patio and views of the Drum Tower. Hotel G, 8th and 10th floors, A7 Gongtixilu, Chao Yang District, Beijing, 100020 China. (Beijing Workers' Sports Complex).+86 10 6552 3600 A split-level rooftop restaurant, lounge and bar serve Mediterranean cuisine with a Tibetan twist. The Beach. Closed for winter. +86 10 6508 8585. Revolving Restaurant, Chengdu Wangfujing Building (Huamin Empire Plaza), 1 Fuxing Street. Chengdu 610016. Sichuan Province. Crown Plaza, 25th floor, Enjoy the best view of the city and discover the delightful Mississppi Grill on the 25th floor where American styles US steaks are served. Sunset Grill, 21st floor, Holiday Inn, No.15 Nanping Bei Road, Chongqing, 400060. +86 23 6280 8888. Sunset Grill has authentic Western food here on the 21st floor. Above the banks of the mighty Yangtze River, overlooking the ever-growing city centre of Chongqing. Revolving Restaurant, 29th floor, Yu Du Hotel, 168 Ba Yi Road, Jie Fang Bei, Yu Zhong District, Chongqing. +86 23 6382 8888. Live entertainment. English menu available. Jita Restaurant, 48th floor, 30 Wanbao Jie, Changchun. +86 431 8566 9830. Northeastern Chinese cuisine. Revolving Restaurant, The Changchun International Trade Hotel, 61 Renmin Street, Changchun, China. At the intersection of Chongqing Lu and the northern part of Renmin dajie. Bohai Mingzhu Revolving Restaurant, 30th floor, Bohai Grand Hotel, 5 Jiefang Street, Dalian, Zhongshan District, Liaoning, China 116001. +86 411 8280 8999. On the top-most floor. Stunning views. Bohai Pearl Hotel Dalian, 30th floor, 8 Shengli (Victory) Square, Zhongshan District, Dalian 116001. +86 411 8265 0888. Revolving Restaurant, Dalian Radio and TV Tower, Dalian. Rooftop Cafe, Silk Road Dunhuang Hotel, 6 East Huan Cheng Road, Dunhuang 736200, Gansu. +86 937 888 2088. Stunning rooftop cafe looking out over the desert hills. Rooftop bar. On the edge of the sand dunes of the Gobi desert. BBQ Restaurant of White Swan Hotel, White Swan Hotel, 1 Sha Mian Nan Jie, Yuexiu District, Guangzhou, Guangdong. +86 20 8188 6968. You can enjoy a good view of the Pearl River and various kinds of food here. The Garden is near the river. Wei Xuan Restaurant, 7th floor, China Plaza, 33 Zhong Shan San Rd, Yuexiu District 748, Guangzhou, Guangdong. +86 20 8373 9000. Korean dishes. Xiang Yun Restaurant, 30th floor, Bai Yun Hotel, 367 Huanshi Dong Rd, Yuexiu District, Guangzhou, Guangdong. +86 20 8333 3998. +86 20 8333 3230. Qing Hui Yuan Restaurant, Sky Cafe, 40th Floor, Asian International Hotel Guangzhou, 326-328 Huanshi Road (east), Yuexiu district, Guangzhou, Guangdong 510115. +86 20 6128 8888, ext 4018. Views of Lu Lake and Baiyun Mountain. Tea ceremony and imperial food salon. 6pm-10.30pm. Carousel Revolving Buffet Restaurant, 30th floor, Garden Hotel, Huanshi Dong Lu, Guangzhou, Guangdong. +86 20 8333 8989, ext 3986. Buffet Dinner 6pm-10pm. Nightly Cocktails 10pm-12 midnight. Taojin Station is situated in front of the hotel. Cafe Paradise, 39th floor, Landmark Hotel, Haizhu Plaza, 8 Qiaoguang Road, Yuexiu District, Guangzhou Guangdong 510115. +86 20 8335 5988. Just next to the subway station in central Guangzhou on the riverside of Pearl River. Right next to Haizhu Place Metro station. Alice French Restaurant, 23rd floor, Pearl River Hotel, Wu yang Xin Cheng, Yuexiu, Guangzhou. +86 20 8737 3695. G Restaurant, 22nd floor, Grand Hyatt Guangzhou, 12 Zhujiang West Road, Pearl River New City, Tianhe District, Guangzhou, Guangdong 510623. +86 20 8396 1234 ext. 3423 Located in one wing of a brand new streamlined twin-tower building. Offers expansive views across the Pearl River and Guangzhou’s new CBD. Situated in Guangzhou’s new central business district Pearl River New Town. Guanxi Lounge, Grand Hyatt Guangzhou, 12 Zhujiang West Road, Pearl River New City, Tianhe District, Guangzhou, Guangdong 510623. Panoramic views of the Pearl River and the city's new Central Business District. 11.30am-12 midnight. The Penthouse, Grand Hyatt Guangzhou, 12 Zhujiang West Road, Pearl River New City, Tianhe District, Guangzhou, Guangdong 510623. Panoramic views of Huacheng Square, Lunch 11.30am-2.30pm. Dinner 5.30pm-10pm. Prego, 40th floor, The Westin Guangzhou, 6 Lin He Zhong Road, Tianhe District, Guangzhou, Guangdong. +86 20 2886 6868 U nrivaled panoramic views of the city's skyline from atop the hotel. A chic, vibrant space. 11.30am-2pm. 5.30pm-10pm. Italian. Ming Ren Hui Restaurant, 36th floor, Da Hua Hotel, 625 Tianhe Rd, Tianhe District, Guangzhou, Guangdong. +86 20 8757 5591. Beautiful scenery outside the restaurant. Taiwan Shaba-shaba Hotpot, 6th floor, Grandview Mall, 228 Tianhe Rd, Tianhe District, Guangzhou, Guangdong. +86 20 3833 0905. Niu Huang Xing (Grandview Plaza Branch), 7th floor, Grandview Plaza, 228, Tianhe Rd, Tianhe District, Guangzhou, Guangdong. +86 20 3835 0181. Daye Feng Fan (Hainan Cuisine), 6th floor, Grandview Plaza, 228 Tianhe Rd, Tianhe District, Guangzhou, Guangdong. +86 20 3833 0831. Las Vegas Buffet, 6th floor, Grandview Plaza, 228 Tianhe Rd, Tianhe District, Guangzhou, Guangdong. +86 20 3828 8275. Great Barrier Reef Food & Beverage Co, Ltd, 6th floor, The Australian Great Barrier Reef Restaurant, Guangzhou Zhongtai International Plaza, 161 Linhe West Road, Tianhe District, Guangzhou, Guangdong. +86 20 8327 8527. Serves up a fusion of BBQ. The Deluse (Linhe Branch) The Tianyu Garden, 5th floor, 160 Linhe Road (mid), Tianhe District, Guangzhou, Guangdong. +86 20 3884 0368. Freezone, 6th floor, Victoria Plaza, 101 Tiyu Road (west), Tianhe District, Guangzhou, Guangdong, +86 20 3879 1687. It has a quite good environment and a huge french window; good view of Tiyu West Road. Guangzhou Restaurant, 4th floor, Baifu Plaza, 112 Tiyu East Road, Tianhe District, Guangzhou, Guangdong. +86 20 3880 9838. New Fusion Japanese Buffet Restaurant, 5th floor, 101 Victoria Square, Ti Yu Xi Rd, Tianhe District, Guangzhou, Guangdong. +86 20 3878 5575. Revolving Restaurant, 22nd floor, Hexing Hotel, 213 North Jianshe Road, Huadu District, Guangzhou, Guangdong. +86 40 0810 6868. Provides a splendid panorama of the city from the top floor. Rotating Restaurants (Two), Canton Tower, Yuejiang Road West / Yiyuan Road, Haizhu District, Guangzhou, Guangdong. Levels +428 and +417.6 Soups can unfortunately not be served since the bending of the building in windy circumstances could reach up to 1.5 meters in either direction, leaving not much soup in your plate! Also find cafe-type food courts on levels +162.8 and +152.4. Gold Coast Marina Club Restaurant, 4th floor, 81 Bin Jiang Dong Rd, Haizhu District, Guangzhou, Guangdong. +86 20 3428 0123. Enjoy the river view. Sonata, 5th floor, Rosedale Hotel & Suites Guangzhou, 348 Jiang Nan Da Dao Zhong, Haizhu District, Guangzhou, Guangdong. +86 20 8441 8888. Kai Wen Cuisine, 5th floor, Kai Yi Hotel, 90 Shi Gang Rd, Gong Ye Da Dao Nan, Haizhu District, Guangzhou, Guangdong. +86 20 8431 1838. They have distinctive Brasil cuisine and the price is quite reasonable. Mai , Level 42, The Westin Pazhou, 681 Fengpu Zhong Road, Haizhu District, Guangzhou, Guangdong 510335. + 86 20 8918 1246 On the hotel's highest floor, this modern Japanese restaurant offers stunning city skyline views. 12 noon-2.30pm. 6pm-10pm. Pazhou Island is an island at the southeast of the central district of Guangzhou. Starwood. Lucky Fellow, 5th and 6th floors, 111 Taikang Lu, Wenchang Nan Road, Lian Xiang Lou, Guangdong. Guangzhou Restaurant. Guangzhou Tianzhihe Japanese Cuisine, 3th floor, Guang Yi Dasha, 34-38 Huale Lu, Guangzhou, Guangdong. +86 20 8360 1371. +86 20 8360 1372. Vue Bar, 23rd floor, Renaissance Guiyang Marriott Hotel, No. 8 Lincheng East Road, Jinyang New District, Guiyang, Guizhou Province, China 550081. +86 851 222 8830 A rooftop bar atop the 23rd floor. Rooftop entertainment bar/lounge with outdoor seating and a good view. Revolving Restaurant, 20th floor, Hangzhou Friendship Hotel, 53 Pinghai Road, Hangzhou 310006. +86 21 6322 3855. Provides delicious Western and Southeast Asian cuisine and a beautiful panoramic view of the West Lake. Hangzhou Tower Revolving Restaurant, Hangzhou. Mingtown Hangzhou Youith Hostel, Restaurant, 101 Nansgan Lu, 0571 6791 8948 Rooftop overlooks the lake. Revolving Restaurant, Jiaxing Ziyang Hotel, Yandai Guomao Building, 25 Ziyang Road, Haining 314400, Jiaxing. 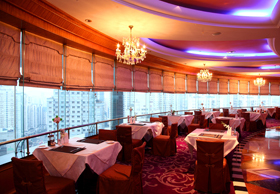 Revolving Restaurant, Pearl Hotel (Zhenzhu dajiudian), 164 Jingsan Road, Huaiyin District, Jinan, 250001. 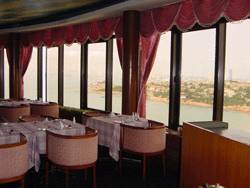 The revolving restaurant provides a romantic environment and great night-view of the city. 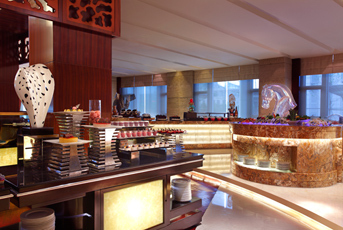 Yue Restaurant, Sheraton Jinan Hotel, No. 8 Long Ao North Road, Lixia District Jinan, Shandong 250098. +86 531 8162 9999 x6888 11.30am-2pm. 5pm-10pm. Feast, Sheraton Jinzhou Hotel, 68 Keji Road, Jinzhou, Liaoning 121001. +86 416 7995410 A relaxing, comfortable place where you can connect and entertain. 6.30am-10am.5.30pm-9pm. 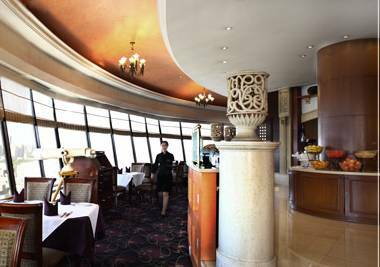 Revolving Restaurant, Horizon Hotel, 432 Qingnian Rd, Kunming, China 650021. +86 53 65 0021. One of the highest revolving restaurants in Kunming. Enjoy a panoramic view of the city's beauty. Silver Sky Hotel, 1 Xiang Yan Street, Chang Chun Road, Kunming. Rooftop bar with brilliant views of Kunming's night sky. Guangzong No. 3 Cafe, 3 Guangzong Xiang, Wenlin Jie, Kunming. Just around the corner from Wenhua Xiang. Opens every day at 1pm. Cacao Mexican Restaurant. In Beichen Fortune Centre, Kunming. The Hump Bar, 1/F Jinbi Plaza, Kunming. Revolving Restaurant, Lanzhou Xilan International Building, 39 Dingxi Road, Lanzhou 730000, Gansu. +86 931 862 8998. 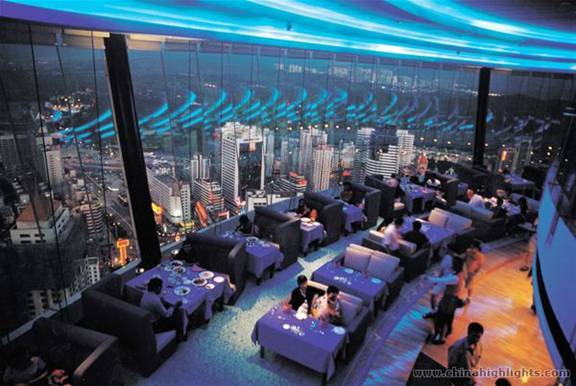 Rooftop Restaurant, 25th floor, Mudan Cheng Binguan (Peony Plaza), 2 Nanchang Road (Nanchang Lu), Luoyang, (Henan), China. +86 379 6468 1111. 180 Lounge & Grill, 59/F Convention and Entertainment Centre, Macau Tower, Largo da Torre de Macau, Macau, SAR Macao. +853 8988 8659 180° Lounge sits atop the Macau Tower, offering panoramic views of the city and surrounding landscapes. Daily 12 Noon-1am. Weekends & Public Holidays 11.30am-1am. 360 Revolving Cafe Restaurant, 59/F Convention and Entertainment Centre, Macau Tower, Largo da Torre de Macau, Macau, SAR Macau. + 853 2893 3339 Lunch buffet daily 11.30am-1pm. 1.30pm-3pm. High tea 3.30pm-5pm. Dinner buffet daily 6.30-10pm. Café on 4, Level 4, Convention and Entertainment Centre, Macau Tower, Largo da Torre de Macau, Macau, SAR Macau. Striking harbor views over to Taipa Island through the impressive French windows. Sands Casino-Hotel, Avenida da Amizade, Macau, Macao S.A.R.. +853 8983 3388. Rooftop Bar, 3rd floor, St Paul's Corner, 3-5-7 Travessa de São Paulo, Macau, Macao S.A.R.. +853 2848 2848. Open only from 9pm. Monday closed. Macau maintains its own separate currency, customs territory, immigration and border controls, and police force. Revolving Restaurant, 20th floor, Lakeview Xuanwu Hotel, 193 Zhongyang Lu, Gulou District, Nanjing 210009. +862 5 8681 1111 Breakfast: 6.30am-10am. Dinner: 6pm-9pm. Seasonal Tastes, 23rd floor, Westin Nanjing, 201 Zhong Yang Road, Nanjing, Jiangsu, China. +86 25 8556 8888 Great view over the Xuanwu Lake. Daily 6.30am-10.30pm. Buffet 6.30am- 10.30am. 11.30am-2pm. 5.30pm- 9.30pm. Revolving "Rolling" Restaurant, TV Tower, Taiping Shan Road, Qingdao, Shandong 266001. +86 532 363 9496. Spectacular view. Daily 12 Noon-2.30pm. 6pm-8.30pm. Lobby Lounge, Sheraton Qiandao Lake Resort, Chun An, Hangzhou Qiandao Lake, Zhejiang 311700. +86 571 6488 8888 x82165. Daily 9am-12 midnight. Revolving Restaurant, 25th floor, Huiquan Dynasty Hotel, 9 Nanhai Road, Qingdao 266003. Offers a great view of entire Qingdao and completes the full circle in about an hour. At the No.1 Bathing Beach. Chinese Restaurant, 21st floor, China Qinhuangdao International Trade Hotel, 208 Gangcheng Avenue, Qinhuangdao. 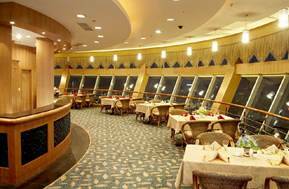 Rotating Restaurant, Jin Ke Hotel, 19 Wenhua Road, Heping District, Shenyang city, Liaoning Province, China 110004. +86 2 8023 8757. Revolving Restaurant, The Panglin Hotel Shenzhen, 2002 Jiabin Road, Luohu District, Shenzhen 518001, Guangdong, China. +86 755 2518 5888. In Dongmen Business District. The city's highest revolving restaurant. Grange Grill, top floor, The Westin Shenzhen Nanshan, 9028-2 Shennan Road, Nanshan District, Shenzhen, Guangdong 518053. +86 755 8634 8431 Located on the top floor of the hotel, Grange Grill, their signature steakhouse has an outdoor bar area and a panorama of Shenzhen viewable throughout the chic space. The unparalleled highlight of the restaurant is the terrace: stepping out into the open air, you will enjoy what must be the sexiest bar in Shenzhen, serving the most delectable cocktails and surrounded by the most magnificent views. Sun to Thurs 6pm-12 midnight. Fri & Sat 6pm-1am. Shuangyashan Mingyuan Edifice, 58 Xinxing Avenue, Jianshan District, Shuangyashan 155100, China. Revolving Restaurant, 29th floor, Aster Hotel, 488 Sanxiang Road, Suzhou. +86 512 6829 1888. Situated only 4 kilometers away from the Railway Station and 80 kilometers from Shanghai Airport. It is the tallest and largest hotel in Suzhou. Unique design which includes a sight-seeing elevator. Restaurant, 49th floor, Tangla Hotel, 9F-A, Huanmao Business Centre, No.219 Nanjing Road, Heping District, Tianjin 300051. From its location on level 49, this stunning restaurant offers a spectacular view of the city skyline. Dinner 6.30pm-11pm. Metro: Anshangdao and Yingkoudao metro stations. Shunsheng Hotel Wenzhou Revolving Restaurant, 25th floor, 36 Lucheng Road, Wenzhou 325005. +86 577 8827 0000. Just at the side of the beautiful Jiushan Lake Park. 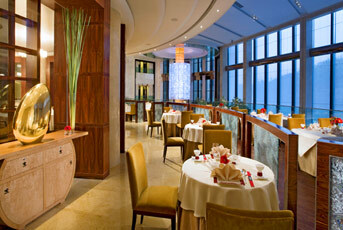 Bene Restaurant, top floor, Sheraton Hotel, 292 Chezhan Avenue, Wenzhou, Zhejiang 325000. +86 577 8888 5595 Unparalleled views of the city skyline. Best Italian food. Mon to Sun 5.30pm-10pm. Sat & Sun 11.30am-2.30pm. Panorama Restaurant, Holiday Inn Wuhan-Riverside, 88 Xima Chang Street, Hanyang District Wuhan, Hubei, China 430050. +86 27 8471 6688. 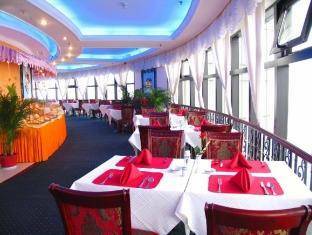 Mingzhu Restaurant, 4th floor, Pearl Palace Chinese Restaurant is an elegant dining space. There are 5 private rooms with various specialties. In short, it has decent Chinese restaurant features both in visibility and taste. 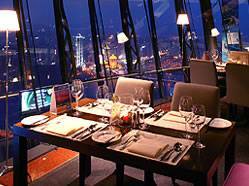 Jinxi Revolving Restaurant, 28th floor, Jinjiang Grand Hotel, 218 Zhongshan Road, Wuxi 21 4002. Overlooks the beautiful scenery of Wuxi. Rome Hotel Wuxi, 1 Zhongnan Road, Bin Hu District, (near Shanghai) Wuxi 214073. +86 510 8232 8290. Lujiang Harbor View Hotel, 54 Lujiang Road, Xiamen 361001. +86 592 266 1379. Rooftop restaurant. Overlooks Gulangyu Island. Perfectly situated to enjoy the waterfront and older city. Revolving Restaurant, Xian Hongye Hotel, 137 Hanguang North Road, Xi'an, Shaanxi, China 710 068. 5km to the city center. Rooftop Bar, Monkey Jane's Hostel, 24 Lianfengxiang, Yangshuo 541900. +86 773 882 1603. Rooftop bar, Yangshuo, Guangxi Zhuang. Pool and hammocks on the roof. Roof Garden Restaurant, Yangshuo Hidden Dragon Villa, Ji Wo Du Village, Big Banyan Tree Scenery Zone, Yangshuo, China 541906. Surrounded by the peaceful and beautiful mountains, Yulong River and rice paddies, it divides into the open rooftop restaurant, enclosed rooftop restaurant and a top tea bar. Rooftop bar, Showbiz Inn Hostel, Yangshuo. Sanyou Cave Restaurant, above the Chang Jiang river, Hubei, China. Amazing! 8 Post & Telecommunication Hub 260 / 853 66 2003 Also known as Guangdong Telecom Plaza. 14 Nanfang International Manson 201 / 659 48 1998 Also known as the Royal Mediterranean Hotel. 15= Guangdong International Building 200 / 657 63 1990 Also known as Guangdong International Hotel and locally known as the 63 Floors.